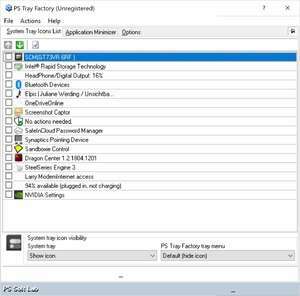 PS Tray Factory is a powerful and handy tool meant to flexibly control ALL the other icons in the system tray of the taskbar. PS Tray Factory will help you to manage all the applications that place their icons in the taskbar tray. When you have installed PS Tray Factory, you will forget about the problem of lack of space in the system tray, and will also get an easy, fast and handy tool to handle those applications. In short, ALL Windows users will get this handy and powerful tool at their disposal, whereas only Windows XP users have an idea of it. PS Tray Factory 3.31 is a shareware program and can be used as a demo to try the software until the free trial period has ended. A full version of the program is available after the trial period ends. For security reasons, you should also check out the PS Tray Factory download at LO4D.com which includes virus and malware tests. Additional screenshots of this application download may be available, too. 3.8 out of 5 based on 5 ratings. PS Tray Factory has a presence on social networks.